This May Be Disturbing to Some Viewers! Warning! The images to follow “may be disturbing to some viewers.” There was a terrorist attack today in Paris, killing twelve at a news outlet known for its satirical postings mocking the Islamic Prophet Mohamed. Radical Muslims don’t understand humor. They rail at cartoons portraying their spiritual leader in a negative, but truthful light. Revenge is their reaction to a joke, and murder is their modus operandi. 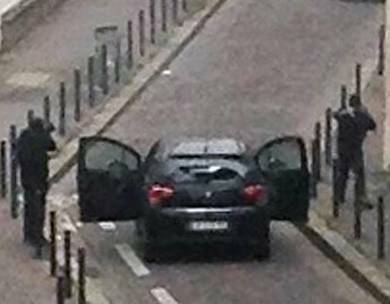 The Paris attackers were heard shouting the familiar “Allahu acbar,” as well as “Allah is avenged”…leaving no doubt where this hatred originated. The Muslim community, which harbors an innate abhorrence for life, is responsible for this deadly rampage, and all other Islamic inspired atrocities. This morning MSNBC host Joe Scarborough offered the usual PC explanation for today’s Paris attack, and all Muslim rage. He stated that immigrants worldwide are unjustly treated at the hands of white Europeans. This disenfranchisement causes their anger, which of course leads to terrorism…and it’s all our fault! This afternoon Fox New’s Neil Cavuto interviewed Bill Donahue who called the French cartoonists “brats” who taunted radical Muslims and got what they deserved! No doubt Joe and Bill will get a grip on their tongues soon, and not repeat these early reactionary statements. But these outbursts demonstrate the natural inclination of the liberal mindset to blame-shift responsibility from the guilty to the innocent. Liberals will not accept responsibility for evil! This may be disturbing to some viewers, but it’s a fact. The world suffers at the hands of evil men, who are enabled by ignorant men! This entry was posted in Uncategorized and tagged ignorance, Islam, liberalism, Paris terrorist attack. Bookmark the permalink.